Is there a way to increase the water pressure when using the water pump? I have a Surflo 3.5 gpm pump which works fine but has less pressure than when I use city water. Have checked all fittings and everything seems ok.
Roland, nothing that I am aware of other than upgrading your pump. Perhaps someone knows someone I do not. You might check the screen on the intake side of the pump. If it is clogged you"ll get reduced flow/pressure. If you don't have a screen or filter, then the pump itself might be clogged. All that's assuming that the pressure was once better. Our Shurflo only makes 45 psi, so it will seem low compared to city water. I installed a shower head designed to work on lower pressure so we still get a decent shower. Joe, do you mean going to higher gpm? Any idea of how high would be safe? Your manual should tell you the maximum PSI your plumbing can handle. The pump Bill recommended would be a nice upgrade assuming your coaches plumbing can handle it. You could also call your manufacturers tech support and ask. I thought I had the specs for our pump. Can’t find them. Our water pressure on pump is actually better than most city. You can also add a pressure accumulator tank to your current pump. 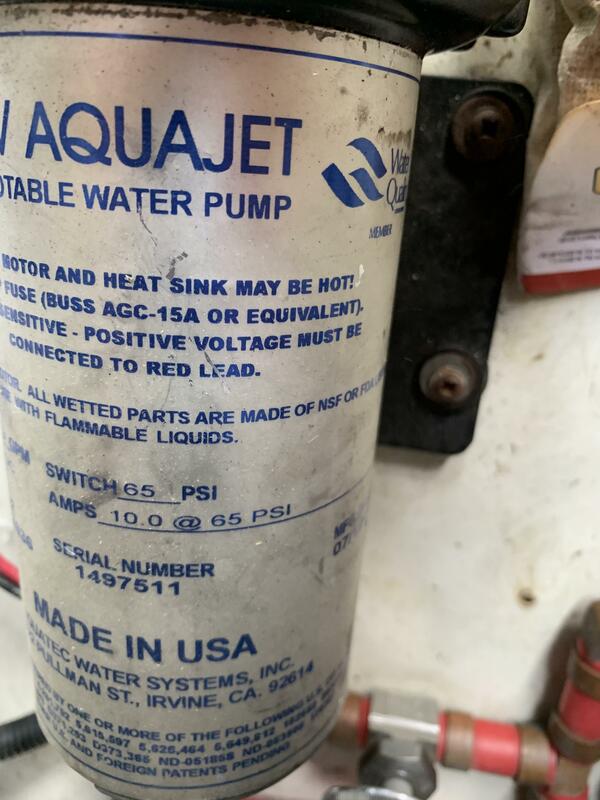 Once it's full, it releases the water at your preset safety pressure, when you use it, the water pump only comes on, when a low point is reached, then shuts off at full. My coach is good for 60 psi, but I set my pressure gauge at 55 psi! GPM refers to gallons per minute - a measure of water flow rate. PSI refers to pounds per square inch - a measure of pressure. In most systems, these two measurements are balanced to provide a good flow at a decent pressure. Many times when someone thinks they are having a pressure problem it's really due to a flow problem. If the pump can't pump water fast enough (flow rate) to replace the water that you're using, there is no way for it to build pressure. 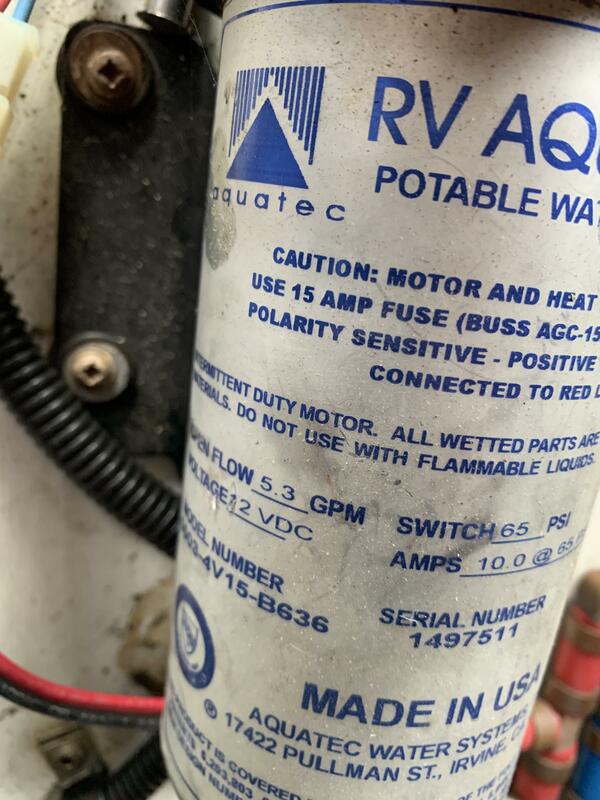 If you're not sure that your pump is working properly, disconnect the output line and divert it into a bucket. Run the pump for one minute and measure the output. It should be putting out 3.5 gallons. If not, there's your problem. As Richard points out, psi indicates what pressure (force) the water is delivered at, gpm indicates how many gallons per minute the pump can produce. If water flow is not great enough to produce adequate amount of water per minute that you want, you can parallel two pumps that are matched to each other, thereby doubling the amount of flow per minute, and as Carl said, a larger accumulator tank after the pump will also help in maintaining a more constant flow of water and pressure, this will also help in the preventing the pump cycling off and on as often. I use a very small accumulator in my coach, but a 1 gallon or 2 gallon unit can be used if you have enough room for it, they are available at lowes, Home depot and many other places that sell well pump supplies, be sure to look for an internal bladder, it will have a valve stem just like on a car tire. Roland, this is the pump on ours. The smallest restriction in the fresh water system plumbing determines total flow rate at the faucets. Most RV plumbing has a high pressure limit of 65 PSI, even though the PEX lines are designed for more. FWIW, I bought my last water pump at a farm store, same brand and model # as the OEM, $35 cheaper than RV store. I would agree if he were speaking of low pressure when on city water. But his low pressure is when he is on his pump. Therefore I believe he either has a restriction just after his pump or needs to upgrade to a higher flow and pressure pump. Yep, water pump is the restriction, either input/output, OR pump head is bad-if it didn't have low pressure when new. RayIN, I would suspect low pressure since new...bean counters! You are correct Carl, pump is only 1 year old and it has never been near as good as 45psi water system. Look at the pump and see what the rated psi is. I checked it and it is 3.0 gpm and 55psi. 3.0 GPM is not much. All the pressure in the world isn't going to feel like much coming out of the tap if the flow rate is not high enough. Have you confirmed that the pump is actually outputting the 3.0 GPM at the pump's output? Don’t have MH with me, I think I might get a new pump with higher ratings and keep the current one as a standby. The OP indicates that it is 3.5 gpm, that is not a lot to begin with, here is one on amazon that will give much better results than the one that you are using now. Only possible downside to going to a larger pump like that would be the existing wiring/fuse. Larger pump = large current draw = possible need for upgraded wiring. Not necessarily a problem, but confirm existing wire sizing and fuse rating before just installing a new pump. I would go with the 5.0, SEAFLO. Much better review, less $$ and 4 star vs 2.5!